With Interactive Exploration of a Dynamical System earlier this month and today’s Scrubbing Calculator, Bret Victor is doing some of the most provocative work in math education right now. As much as I’m curious how STEM educators perceive his work, I admit I’m much more interested in the perceptions of educators in the humanities and of people who, at one point or another, were totally put off by the abstract symbology of mathematics. If our goal is to empower students to do more and more interesting mathematics, we can’t just hand them simulators and tell them to go play: we need to teach them how to create those simulators. Doing that requires a lot of math and a lot of programming. So Victor’s “simulation” model of doing math ultimately requires teaching kids a lot of traditional mathematics. Of course, replace “simulators” with “calculators” and we have another familiar argument. Obviously, I’m of two very different minds about this. The teacher put up this photo at the start of class and asked her students, “Where’s the maths in this picture?” She asked them to discuss the question in their groups while she took attendance. 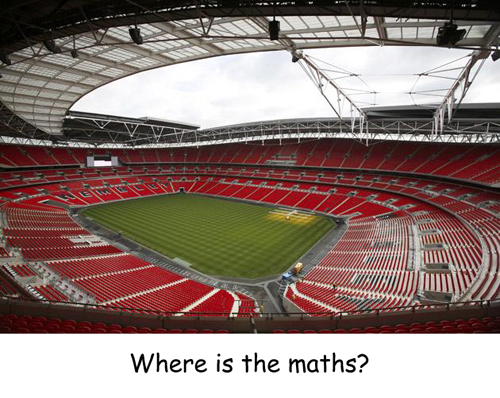 After four minutes, she pulled them back together and asked a student from each group to tell her where they found the maths in Wembley Stadium. “The amount of seats,” one student said. “Area and perimeter,” said another student. “The number of seats,” said a third student. “We already have the number of seats,” said the teacher. The teacher pressed a little — what lines? what perimeter? — and then accepted it. After two more groups, a girl named Sarah said something I can’t quite make out on the video, but the teacher was visibly floored. If you give students some photo of their world and tell them, “We’re definitely applying math to this — you figure out how,” you’re confusing the master and the servant in the relationship between math and their world. If a majority of your students are interested in a single question (eg. the number of seats) then use it. That’s a gift. Can math help your students resolve that curiosity? Conversely, if you are shocked when your students’ questions zero in on the point of your lesson, you’re designing your curriculum for the only person in the room you shouldn’t care about. There’s a big fault with this sort of question that you didn’t mention: students start skipping the mathematics altogether and try to determine what it is the teacher wants them to say. It’s the equivalent of the teacher asking “What number am I thinking of?” then waiting for a bunch of answers. It’s a totally different game, decidedly not math, and not even close to good inquiry-based teaching. Such questions should either be clarified or just not asked in the first place. Someone climbing up a ladder and jumping off a diving board (height above water). Someone riding a merry-go-round or carousel (distance from center, distance traveled, height off ground). Someone riding an elevator, watching the lights change as the floors pass by (height above ground floor). An airplane taking off (elevation). Someone driving up to a stoplight and then a stop sign (speed, distance from camera). A step function. Any step function. Someone throwing a boomerang (distance of boomerang from thrower). Someone running the bases at a baseball diamond (distance from home plate, distance from the pitcher’s mound). Someone riding a ferris wheel (height above ground, distance from center, linear velocity, angular velocity). Add yours to the comments. Better yet, make it and submit it!